ATV power and speed are those criteria which should exactly fit the capability of a small rider all the time. 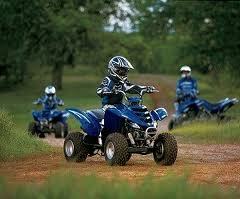 Parents are responsible for the safety of their kids during ATV riding. 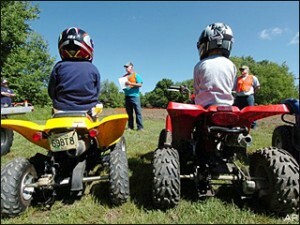 A parent should realize the responsibility and the risks parents and kids both are facing during ATV riding. A governor is a perfect solution to allow your kid to drive the vehicle at a walking pace for a period while mastering the basics of riding. The area where the mastering takes place is another factor to keep in mind as the territory should be clear of any obstacles challenging the safety of a kid and it should be free of people and pets that could be harmed and injured in case of the collision. As the proficiency of a kid improves, the speed limits of the ATV can be gradually increased to the next safe level. Another solution for kids’ ATV is a Meerkat 50 transmission which is put on a vehicle in a way that locks it into a gear and thus it performs as an automatic vehicle. When the kid improves his or her skills and gains more experience in four-wheeler driving the gearbox can be transmitted to a higher gear in a way that replaces the lever of a gear and puts it into a higher one. This way the four-wheeler will still operate as an automatic ATV. For more experienced young riders, a lever of gear can be left on thus providing four semi-automatic gears for a greater experience. 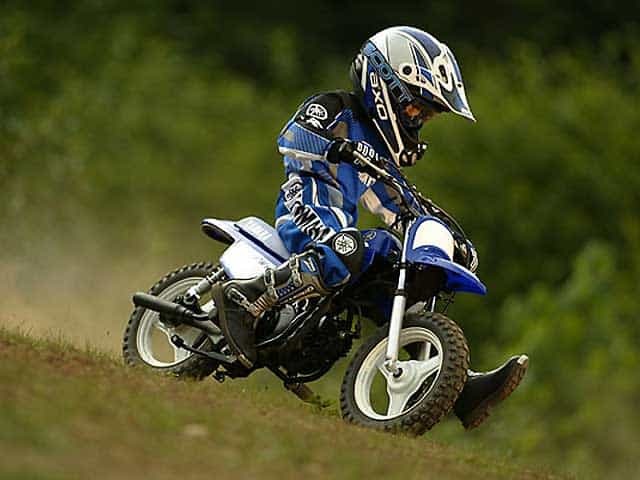 In such a way a kid will develop riding skills from a beginner to expert and mature to graduate to the next size ATV. The safety information provided in this manual is of immense importance and is for obligatory reading and practice. This ATV is designed for terrain/off-road use only. *The following information though it considers children driving smaller ATVs, can still be applied to beginning riders of all ages. The safety of a kid or a teenager you educate on proper operation of the ATV will totally depend on your commitment and time you devote to the process. Proper instructions and supervision gave to a kid before first riding is of great importance for the safety of a beginning rider. This manual is as well of great importance for you and your kid so it is highly recommended to go through it page by page. You should fully teach and explain to your kid all the challenges, requirements, warnings and instructions the manual gives. Safety precautions as well as operational techniques are of prime importance and should be explained in the beginning. Following these step-by-step instructions will help make the first experience of your kid on the ATV safe and enjoyable. Before using this guide you should carefully study the user manual and learn and check all the features of the vehicle and the riding techniques described in the guide. Breaks are necessary anyway to give some rest to your child as tiredness will reduce the attention and concentration on the road which is of utmost importance for the safe operation of any vehicle including the four-wheeler for kids. Protection of the ATV rider is an essential condition for safe riding. A rider should always protect the head with a helmet, ha proper eye protection on, wear gloves, a long-sleeved shirt, and proper long pants and boots. In colder weather a jacket is preferable. Kids should avoid wearing loose-fitting outfits. Some belts and scarves may get trapped in rotating parts of the vehicle and thus injure a rider. Hot weather is not an exception to wear long pants and the same long-sleeved shirt for a kid. Such clothes not only cover the body and protect from abrasive injuries but also reduce exhaustion from riding which is enhanced by constant loss of body heat due to the continuous exposure to wind. The most important step in educating a kid is making him or her familiar with the vehicle. You should explain all the names of the parts, their principles, and controls. If necessary you should demonstrate the operation and control of the four-wheeler in action. You should practice the operation with a kid until he or she can operate all the controls of the ATV without the slightest hesitation or looking at the controls themselves. Review all the rules, instructions and regulations with the kid until he/she knows all the necessary items. Add to the education process specific examples of things and issues to look for. Let the child sit on the ATV. Tell the child to look straight forward while you slowly push the ATV from behind giving the kid a feel of driving the vehicle on his/her own. While moving the ATV you should instruct your kid to direct the ATV straightforward and practice stopping and turning the engine switch OFF during driving. You should track all the actions of the kid to be sure they are performed correctly and watch that the controls are not looked at during performance. When you approach the finish line of the practice area, give your kid further instructions on stopping the ATV. Drag the back end of the ATV so you can give it a push in the opposite direction. Practicing ATV driving with the engine OFF should last until the kid has mastered the feel of braking and stopping the vehicle as well as turning OFF the engine switch with no hesitations or looking at the control panel. Speeds up slowly opening the throttle at the start. Correctly releases the throttle while simultaneous applying the brakes to stop. Become aware of the distance necessary for a vehicle to stop when the engine switch gets turned OFF during ATV movement. As a kid will approach a finish line of practice area you should tell him to get off the vehicle and turn it back so the kid can continue the practice in opposite direction. The exercise should be practiced until the kid feels extremely confident in starting off, cruising and properly stopping the vehicle. Shifting the body weight slightly forward and keeping the weight on the outer footrest. Leaning with the upper body to the side of the turn and pressing down with the opposite leg. When the kid is confident turning the ATV in both directions in the engine OFF mode then the rider should try turning the ATV under power. You should make sure that the throttle controller is set to perform a maximum low speed. Keep track of the techniques of the kid during driving the vehicle straight forward and turning it. The exercise should be practiced until the child possesses full confidence in every move. When the child gets the feel of the basics of the ATV control in the above steps, the final practice should be trying all of the maneuvers together in a single drive. Instruct your kid on the technique and maneuvers he/she should perform during the drive: turning left and right, stopping, starting off again. You should give the kid various tasks resembling real terrain driving so the kid cannot guess what task will be next and thus will not be ready to execute the task. In this way, you will understand the child’s level of mastery of all the maneuvers. This is a perfect exercise to acquire the basics of ATV driving. For getting more experience your kid will need lots of practice and theory mastering in addition to the knowledge she/he received during their introduction. After the basics of ATV driving are mastered, the throttle controller can be adjusted to a higher speed limit. Some 50cc ATVs come with a specific semi-automatic transmission gear that can be adjusted to any gear. It is advised to start the ATV in second or third gear with the speed controller set to the slowest possible speed. You should not let your kids use foot gear shifting. When your child becomes more confident and experienced with handling the ATV, you can reduce the speed controller and thus increase the maximum speed the ATV develops. Set a speed limit which is comfortable for you. You should not explain or teach your kids foot shifting until they have totally mastered the ATV. For those kids who have zero experience in ATV driving, the gear shift lever is recommended to be removed totally. This will disable a possibility of shifting gears by chance and thus prevent accidents or collisions. The gear controller can be reinstalled later when the child gains the necessary abilities and skills in driving the ATV. To secure your driving experience with ATV there are some tips you should keep in mind. The main tip is that you are the only one who can protect yourself. Your safety and safety of other people is totally in your domain of responsibility. Read carefully and consider all the warning signs and marks put on the vehicle. If these fade or get removed you should immediately replace them with new ones. Study all of the instructions given in the manual and get sure you understand all of them properly and are able to operate the vehicle. You should make your first riding attempts under a strict control of a teacher or experienced rider until you gain necessary level of expertise. Never take passengers on board as additional weight and different weight distribution over the body of the vehicle will alter the handling and control drastically. You should never exceed the load capacity of the vehicle. Any cargo transported with the ATV should be properly distributed and fastened securely. You should keep in mind that under a condition of greater load the vehicle will need longer distances to break especially if pulling a smaller trailer. In case of overloading or improper load distribution, the vehicle may get damaged as well as run out of control. A rider should always wear excellently fitting protective helmet as well as eye protection, long pants, and long-sleeved jacket or shirt together with gloves. All of the ATVs are designed for off-road driving only. The vehicles cannot be used on public streets or on the roads of the city. The vehicle should never be operated on tarred, paved or cemented surfaces. You should keep to the local riding rules and regulations before making your first ride. You should check local environmental protection laws and regulations and follow them. You should not pollute or harm the environment in any way keeping it clean and enjoyable for other people and you yourself. Never apply any additional unauthorized accessories and add-ons to the ATV. 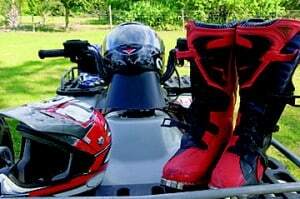 Always hold the handles of the ATV securely as well as keep both of your feet on the footrests. Never perform any tricks as jumps or wheelies with the ATV as it is not designed for tricks. Never exceed the speed that you have a good mastership of or under certain conditions requiring lower speeds. Never sit on the ATV being excessively tired or under alcohol or drugs as all of these conditions drastically affect your attention and concentration. Check your ATV each time before you are going to drive it and make sure there are not faults or mechanical damages of tires or controls. Keep you ATV in safe condition all of the time with sufficient levels of all necessary fluids and tire pressure. Do not skip any scheduled inspection or maintenance. You should not use the ATV in flowing water or in the water deeper than 5 inches. Always keep the pressure in tires at the recommended level to reduce risks of tire damaging and collision. Refuel your ATV only in engine OFF mode. Do not start the ATV engine in the closed spaces and areas especially sitting on the vehicle as this can turn FATAL. Keep in mind that oil form the just stopped engine can be extremely hot and you should perform extreme care and cautiousness when changing it. Apply only correct fuses as incorrect fuses may cause fa ire. Be cautious when checking the fluid level in the attery as a spark can cause the battery to explode. 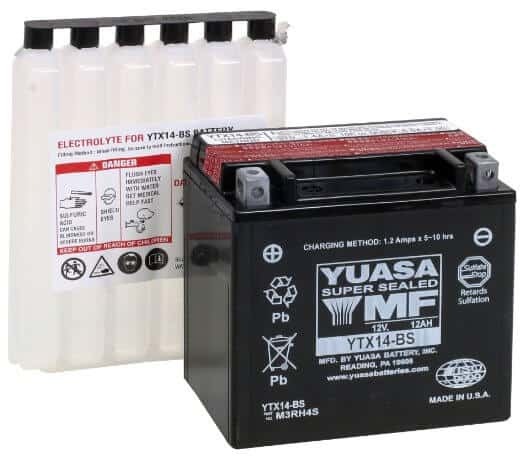 Carry out the checking of the ATV battery while the engine switched OFF mode to avoid sparks. Never touch the ground with your feet when starting the vehicle off or during its moving. The condition of your four-wheeler is totally your responsibility. You should take care of its maintenance and upkeep. People should not operate ATVs beyond their physical might and mental abilities. You should always have the user manual at hand and keep it in a safe place on your vehicle. It is highly recommended to keep the manual under the seat. When mastering ATV driving you should opt for a level, free of people, animals and obstacles ground. Always keep to the laws and regulations. Get in touch only with your dealer if some points and issues of the ATV using are still unclear. Do not let untrained people to ride your ATV as in this case you challenge his/her life and lives of other people surrounding you. ATV throttle, accelerator and cables should be cleaned. Jammed parts can sufficiently affect the performance of the vehicle, cause its mechanical damage or even lead to an accident. 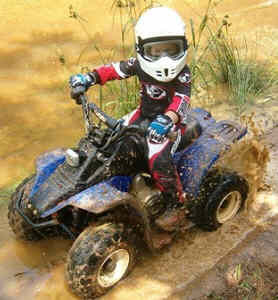 Some countries ban driving ATVs which are 50cc and smaller by the riders under 6 years old. ATV drivers under 16 should operate the vehicle only under adult supervision and after mastering the basics. All the ATV drivers should get a course of safety technique instructions. You should not use any gasoline (petroleum) to clean the parts of your four-wheeler. The smallest spark can cause FATAL EXPLOSION, thus you should keep a fire extinguishing cylinder at hand when carrying out maintenance or working at your four-wheeler. Extreme slippage on the chain drive may cause its break down which can consequently lead to an accident. Any change in the braking mode should not be neglected. Fix all the faults with bthe raking system before riding as any fault can cause aan ccident. Beware! The wire connecting CDI and sparkplug is under high voltage that may cause fatal shock if touched when the ATV is operating. Don’t touch any part of the just stopped ATV especially ethe ngine, silencer or exhauster as these may be extremely hot. Don’t drain any liquids from your ATV using your mouth as these can turn toxic. Clean your skin in case getting some liquids splashed. Be cautious and wipe out any splashed oil or grease that may cause you slipping or losing control of your four-wheeler. Do not let kids or pets fuss around your ATV when it is left unattended. Avoid loose clothing and hair when driving ATV otherwise, it can get in the rotating part and injure you. Keep in mind that many people have their fingers or limbs cut being pulled into rotating parts of the ATV, chains especially. WORKIGN ON THE ATV WITH RUNNING ENGINE IS FORBIDDEN. If you get injured despite all of these instructions seek for emergency help immediately. This article has been very informative. I have been looking at four wheelers OR something for my grandchildren to ride while they are at my house. This information gives me a place to start on what to purchase, what to look for, and how to keep everyone happy and safety first.